What do our customers think of Mountainfeet? We wanted to say in a few more words just how delighted we were with the service and attention to detail you so kindly provided us with. Your knowledge of all things foot related is outstanding and it still remains a mystery to me as to how you managed to identify ankle ligament damage sustained some 45 years ago. 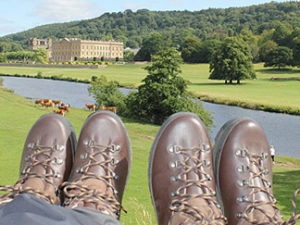 We walked 10 miles today with our new Alt-Berg boots and were absolutely delighted with them. We both felt completely comfortable with them and this lasted throughout the walk. We will certainly be recommending you to other hill walkers we know and will not consider going anywhere else for future purchases of boots and approach shoes. Once again, thank you for taking so much time to ensure we got the products we needed and tailored to our individual needs. If you value your feet, then visit Mountainfeet. Exceptional service, insightful staff and great products. I found Mountainfeet on an internet search after having a lot of pain in one of my feet. I knew I had problems with over pronation but the pain in one foot had become unbearable. I easily booked a one hour session on-line and found the directions were spot on. Si was fantastic and knew immediately what the problem was. He then took time to explain what was happening and why and did several tests to ensure the products he suggested would help. I was amazed at what I learned about my feet and on top of everything else I found that I’ve been wearing the wrong size shoes for years! Si also suggested a regime to help improve the problem with my foot and it has really started to get better. I left with some brilliant sandals to wear everyday around the house and some superb insoles for my everyday shoes. I was so impressed that I returned a few weeks later to buy walking boots, trainers and more sandals. I absolutely love all my new purchases but my feet love them even more. I can really tell the difference already and Mountainfeet will now be my first call for future footwear. I cannot praise Si enough for his expert help, excellent knowledge and the brilliant service he provides. You just need to go and see for yourself – I promise you won’t be disappointed and your feet will thank you for it! My wife and I visited Mountainfeet for new walking boots – what a great experience, whichever outdoor shop you visit in the surrounding area you will not receive the world class customer service that you receive from Si at Mountainfeet. The knowledge that Si has about footwear, the function of your feet and the boots they need is unsurpassed. The visit is not just about going out to buy a pair of boots – it’s much more than that. If you are serious about walking and looking after your feet in the process then there really isn’t another shop you should be visiting, the service you get from Si does not exist anywhere else. We have already tested our boots on a couple of short walks and they are perfect, we will be giving them a good workout next week in Northumbria and then it’s on to the Outer Hebrides. Thanks for making our visit a great experience Si and of course Gyp. I wish to give a big thank you to Si for the excellent service that he has given me in sourcing my new boots. What he doesn’t know about your feet and the boot that would suit you the best is not worth knowing. I could not visit his shop as I live a hundred miles away, but he was able to provide me with an online fitting service that has proved to be exceptional. I would recommend Mountainfeet to anyone and will refer my walking friends to him. Just a short note to say how pleased I am with my new Meindl Borneo boots. After 15 years of ill fitting boots after a 1 hour boot fitting session at Mountainfeet I’ve finally found a pair that have fitted perfectly, straight out of the box. You can’t imagine what a relief it is to finally find a pair of boots I can walk all day in comfort. Thank you! 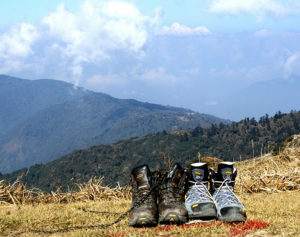 I am attaching a picture of our boots enjoying a well earned rest on the Singalila Ridge with Everest, Lhotse, Makalu and Chamling in the back ground. Our team thought we were barmy to take them off and photograph them, but that’s what we wanted to do! Hannah and I want to thank you for the best boots EVER! Even after a hard days trekking we have been loathe to take them off as they are as comfortable at the end of the day as they were at 5.30 a.m.! We appreciate very much the concentration to detail that you achieve when fitting the boots and the proof of that is we had no blisters, hot spots or discomfort and we did about 100k. Looking forward to the next pair! I popped up to Mountainfeet for some new boots last night and I must say I have never before experienced such a high level of expert customer service. Si, who owns the store, is passionate about the doing things properly. He kept the shop open late to wait for me to arrive from Manchester, I was made a cup of tea on arrival and then spent an hour and a half in the shop discussing the best and most appropriate footwear. I tested a range of different boots on a treadmill so he could assess my feet to see how I walked in the different boots and then he gave me his advice on which boots he thought I should take (not just the most expensive ones). He even had a skeleton model of a foot to show me how I was walking – he certainly knew more about my feet that I did!!! Can’t thank you enough for your help and patience today. Jackie and I are both delighted with our boots and the way they fit. Can’t wait for our hol in Scotland beginning of September to give them a proper outing! Jackie is chuffed with her orthotics too. You certainly know your stuff!! Your skill, knowledge and attenion to detail are second to none. If you ever need a sitter for Gyp just let us know!! 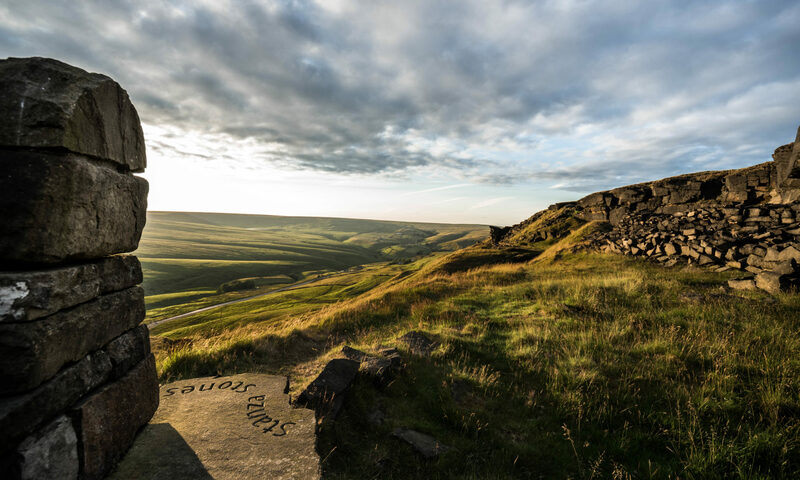 I had originally purchased a pair of Inov8 Roclite 315’s from a major chain store, based in Manchester City Centre, and whilst I have no issue with the service, it was nowhere near the fantastic level that I (and I’m sure all others) receive when they shop for Inov8 shoes in Mountainfeet of Marsden. Seeing that Mountainfeet is recommended by my running club and around 6 miles from my home, I decided to check out their store, and was immediately bowled over by the service. I was greeted like an old friend and felt relaxed and comfortable that I was being dealt with by the most knowledgeable and professional staff, who really are a credit to Inov8. I told one of my running friends about my experience, and he ditched his Adidas fell shoes for a pair of Roclite 315, and again the service was first class. He must have tried about 4 different pairs by different manufactures, and all the time you got the impression that Si didn’t want to sell you anything that wasn’t right – a great example of treating customers fairly and again reflects very well on Inov8. In fact I came away from the store with the strange feeling that Si knew more about my feet than I did! I’m really pleased with my Roclites, as is my friend, and what made the experience of getting these trail shoes all the better was the service at Mountainfeet, where it is a pleasure to shop. I really believe that Mountainfeet should be commended for their service and I hope others are moved to tell you about their experience too. I just wanted to say a big thank you for the excellent advice and customer service I was given when I bought my boots from Mountainfeet at the end of last year. I have recently completed the Annapurna Circuit in Nepal in the middle of winter. We got snowed in for a few days at 4500 metres and were then walking in deep snow for 4 days. I was the only person whose feet were dry after a day trekking in the snow. Everyone else was huddled around the fire in the lodges drying off their boots and socks! So many thanks Mountainfeet for keeping my feet warm and my boots dry. The pair I finally purchased I took with me to the Highlands of Scotland the following week. I wore them day in, day out for a week and they were the ultimate in comfort and ease. Finally, after 30 years it’s goodbye to blisters and discomfort!!! Thank you sincerely Si, hope to see you in a few years if or when these wear out! Si has a comprehensive and expert knowledge of all aspects of the mechanics of boots and footwear for the great outdoors and the shop has an excellent and extensive stock range. But what makes the whole Mountainfeet experience even better is the addition of the correct specialist insole from a wide selection he has available. The insole can even be shaped to suit your feet. Perfection! The empathic and friendly service make a visit to Mountainfeet unbeatable. Very highly recommended! I’ve been running for the last 29 years starting after taking part in a 5km fun run at Chatsworth House in Derbyshire and getting hooked! Over the years I have taken part in road marathons, off road marathons, longer off road trail races and mountain marathons on the Isle of Man and managed to stay injury free for most of that time. But on a weekend away in October 2011, scrambling and hill walking in Snowdonia, I came a cropper! After climbing up Crib Goch I slipped on a smooth bit of stone and broke my right ankle and badly sprained my left resulting in being airlifted off to hospital for potting up. Three and half months later, when the cast had been removed and after physiotherapy, I was able to run a local 10km and was very pleased with that. I went on to do a couple of local fell races – steadily as I very nervous about going over on ankle, but after the second one my feet were so painful that I could hardly walk the next day, mainly around the big toe joint and surrounding area. I then started having problems every time I ran so visited my chiropractor who checked everything over and noticed I was not standing correctly and my weight was not balanced properly over my feet. She recommended I go and see Si at Mountainfeet who was knowledgable in this area and might be able to help. I called down to see Si and he checked everything over and advised me of the reason I was getting the pain and what could be done about it. He also assessed my running style on the treadmill and supplied me with a pair of inserts to help correct the misalignment . The contrast was amazing – even after the ﬁrst run with them in I could tell the difference. I have about 4 sets now (saves changing them from road shoes into trail ones and vice versa) and am back to running at nearly the same training schedule I had before my accident. If I’d not been kitted out with these inserts I would have been in dire trouble, probably not only unable to run but in pain from day to day life, so many thanks to Si for all his knowledge and being able to help me regain my favourite hobby.